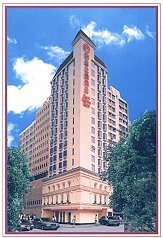 The Drosett Garden Hotel is located close to the Kowloon Cricket Club and the India Club, on a corner site that makes the junction with Nanking street and Chi Wo street, Yaumatei, adjacent to the Jordan MTR station. The vicinity is a favourite tourist attraction and commercial area, only minutes away from Hong Kong Island, Central District. The image of the Pearl Garden Hotel is that of a French Boutique in style, making use of limestone from Europe, with the addition of carefully crafted classical motifs to the podium, creating "Chateau Pitched Louvers" at the top of the building. The 100 guest rooms, offer a selection of suites, studios, doubles and twins, at attractive competitive prices. The guest rooms are intimate, fully utilizing the area by clever design, using materials and colours to give a classy, yet stylish and comfortable ambiance, to satisfy the discerning traveller.